I do not speak Tigrinya or Arabic, but I speak the language of grief. As soon as I was off the plane in Ben Gurion Airport, my best friend Susan and I locked arms, on our way to a Tel Aviv Park to join a memorial, a de facto shiva minyan for an Eritrean man. That previous Sunday, Haptom Zarhum was killed in the chaos that followed a terrorist attack in a Beersheba bus station. An Israeli security officer shot Zarhum believing him to be the attacker. On the ground bleeding, Zarhum was beaten by an Israeli mob beat as he lay in a pool of his blood. He died shortly after from his wounds. I do not speak Hebrew, but I speak the language of rage. Haaretz, Israel’s English language daily newspaper, reported Haptom Zarhum’s death as a lynching. He was just 29 years-old. 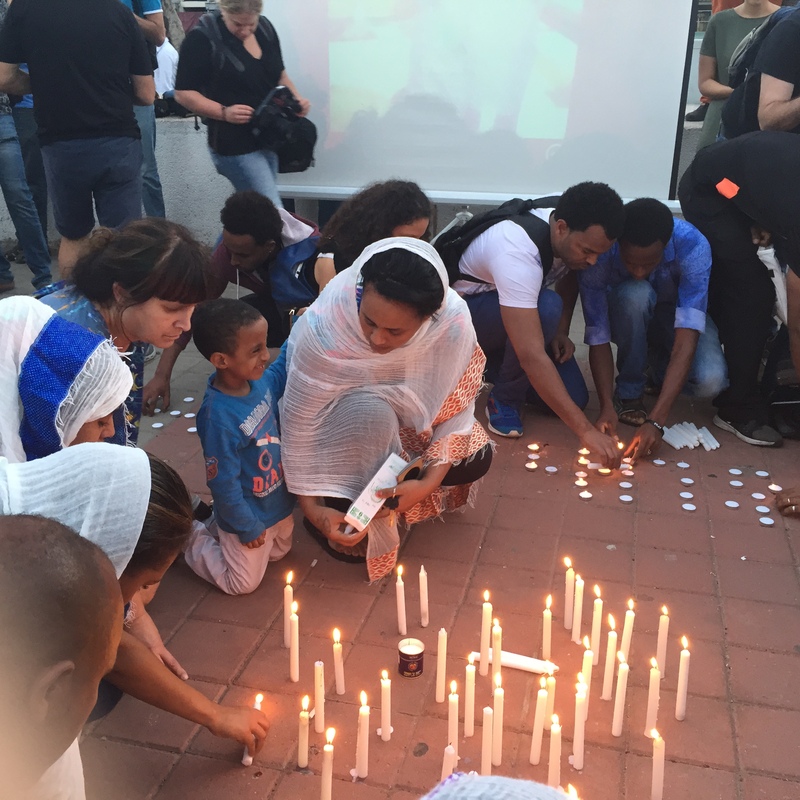 In Levinsky Park, families lit white candles with their children. The candles were arranged in the shape of a cross. There was crying, there was keening. Women, with white scarves wrapped around their heads and holding babies, quietly wept. Men openly wailed. “It’s good to be together,” an Eritrean woman conveyed to me in a fractured, earnest English. There are about 40,000 Eritrean and Sudanese asylum seekers in Israel. The Israeli government is unresponsive to their pleas for asylum.